apply for Assam HSLC 10th class exams using the official website of Secondary Education Board of Assam SEBA www.sebaonline.org before last date. Assam SEBA 10th class examination are going to be organized in the month of March-2018. Instructions for filling the application available on the Assam SEBA official website. Exam Time table will be available soon on the SEBA website. Secondary Education Board, Assam SEBA is going to conduct HSLC annual exam in the month of March 2018. Time table will be uploaded shortly. Students need to plan for Exam preparations. HSLC Examination Admit cards available from February-2018. 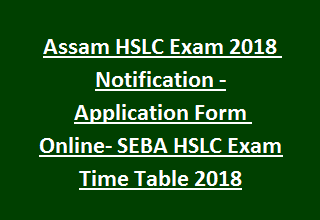 Assam SEBA will announce the HSLC Examination 2018 Results in the month of June-2018. For any queries please go through the SEBA Assam official website. HSLC Application Process ends on: 22-November-2017. Students have to apply for Assam HSLC 10th class exams using the Secondary Education Board of Assam SEBA official website @ www.sebaonline.org. Online application forms available from 06-November-2017 to 22nd November-2017. Board of Secondary Education SEBA will announce the Date sheet/ Time Table for HSLC Examination shortly.